The blog has been totally halted lately due to the unfortunate downtime for my iPhone’s camera. This is a sad tale of the day I came home from the gym and discovered that my iPhone camera was pitch black and broken. I thought I was sentenced to only taking selfies until the new iPhone makes is debut. But on a beautiful day of beer tasting in Chapel Hill, my camera came back to life. Maybe it was the great company and amazing day or maybe the beer spilled on it, but it is back in action. In other news… Green beans are probably my favorite vegetable and they are really getting going in my patio garden. Honestly, they are perfect just boiled and sprinkled with salt and pepper. This recipe is a combination of a few different southern green bean recipes out there. I love the idea of adding pecans to these. Nothing seems more southern than bacon and pecans. It is also sort of a take on the way I remember my dad making green beans, either with almonds or with bacon. I will say that this is very similar to the way I like to make kale, brussels sprouts, and other sorts of veggies… bacon + onions + garlic + red pepper flakes. You really can’t go wrong with this. 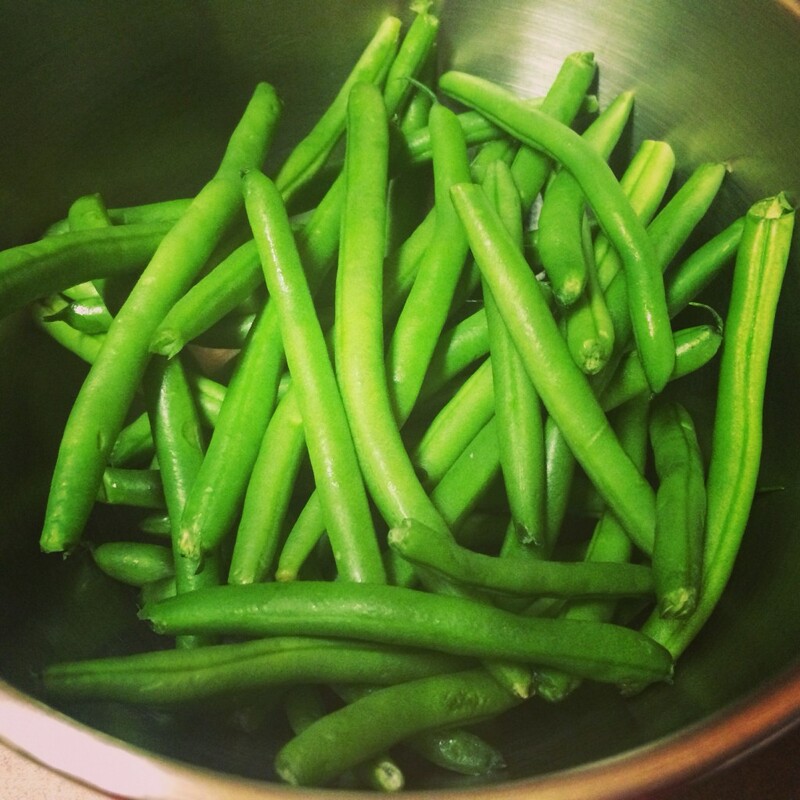 This is my very favorite green bean recipe. My second favorite is to make green beans with chicken piccata and make extra sauce for the veggies. And although green beans are wonderful and fresh in the summer, this dish actually gets me super excited for fall and thanksgiving food. 1/2 cup chopped toasted pecans. Prepare a large pot with salted water and bring to a boil. Cook the green beans in the boiling water for 5 minutes. While they are cooking prepare a large bowl with icewater. Drain the green beans and immediately plunge them into the ice water. 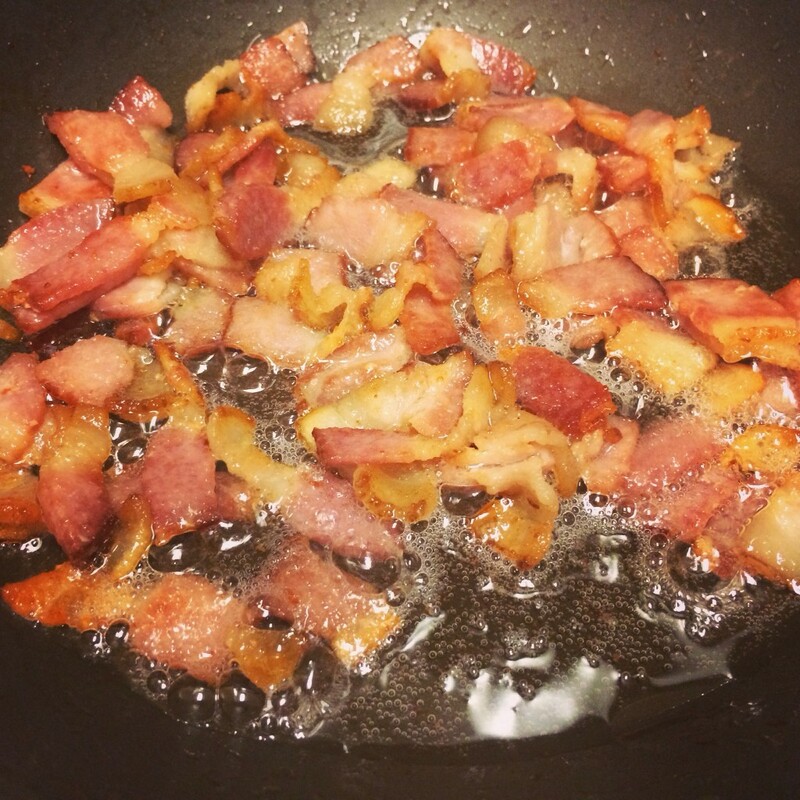 In a large frying pan, cook the bacon over medium until the grease is rendered (not too crispy). Remove the bacon with a slotted spoon to a bowl lined with paper towels. Keep 2 tbsp bacon grease in the pan. Add the onion and saute for 5 minutes, till clear and soft. 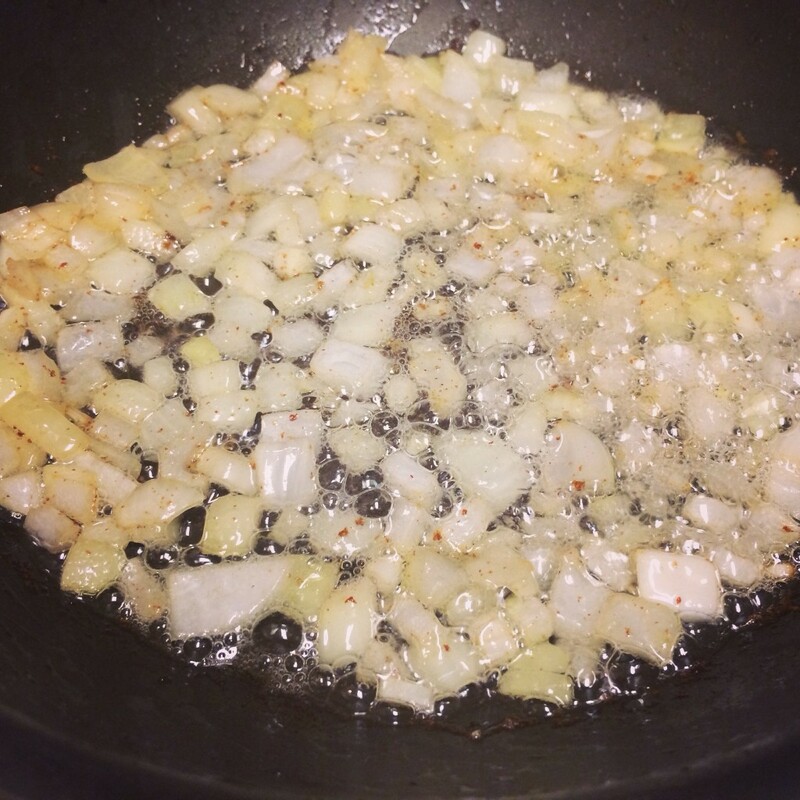 Cook the garlic and red pepper flakes for one minute. 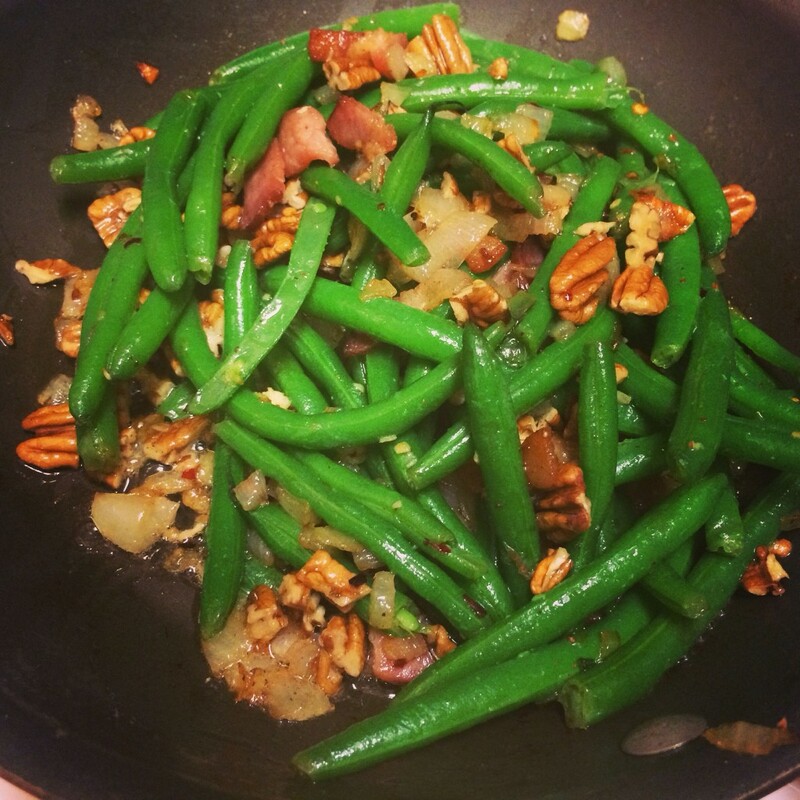 Toss in the green beans and the pecans. Cook until heated through. Toss in the bacon. Taste for seasoning and add salt and pepper as needed.